For anybody that is currently searching for a party bus in Jackson, then you can rest assured that your search has finally come to an end. Here at Rockstarz Limousine and Party Bus, we specialize in providing our clients with an amazing party and experience, no matter what the special occasion may be. 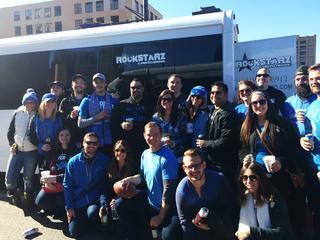 Our Jackson party bus rental options are designed to make sure that you are able to invite along as many people as possible. This is able to happen because of the design and layout of the interior of the bus that has been done in such a way so as to use the maximum amount of space. Also, we have thrown in some leather seats to provide you with somewhere to relax when the party is just getting too much for you. With our Jackson party bus service, the first thing that you will notice when you board is not only the space, but also the possibilities for an amazing atmosphere. This happens because of the state of the art sound system that will blast that music throughout the bus along with the laser light show that is designed to just pump that atmosphere up to a whole new level. It really is like a private nightclub. Previously, people have hired our party bus for a number of different kinds of celebrations. No matter if you are looking for something for a special birthday, or an anniversary, or perhaps even just a bachelor or bachelorette party, we can help. Of course, you might just want to have a cool party with your friends, in which case we can still provide the perfect backdrop. So, if you live in the Jackson area and are looking for a party bus, then give us a call at Rockstarz Limousine and Party Bus. The other option is to contact us via our website and a member of our team will be in touch to discuss your own individual needs.